The two primary functions of a gorget are to protect the neck and act as a harness and support, both of which our Gothic Leather Gorget does very well. How does a gorget offer support, you may wonder? It attaches to, and consequently, bears the weight of, the pieces of armor worn over it. In medieval times, many featured straps, to which heavy armor plates could be attached. Our Gothic Leather Gorget features similar straps, which are designed to support and secure a set of pauldrons. And of course, the gorget also serves to protect the neck. This gorget is ribbed, both in front and in back, and secures around the neck at the shoulders with a pair of buckles and leather straps. It is also hand-made from high-quality 13/15 oz. leather that is durable and strong, making it a great choice for use in the crafting of armor. 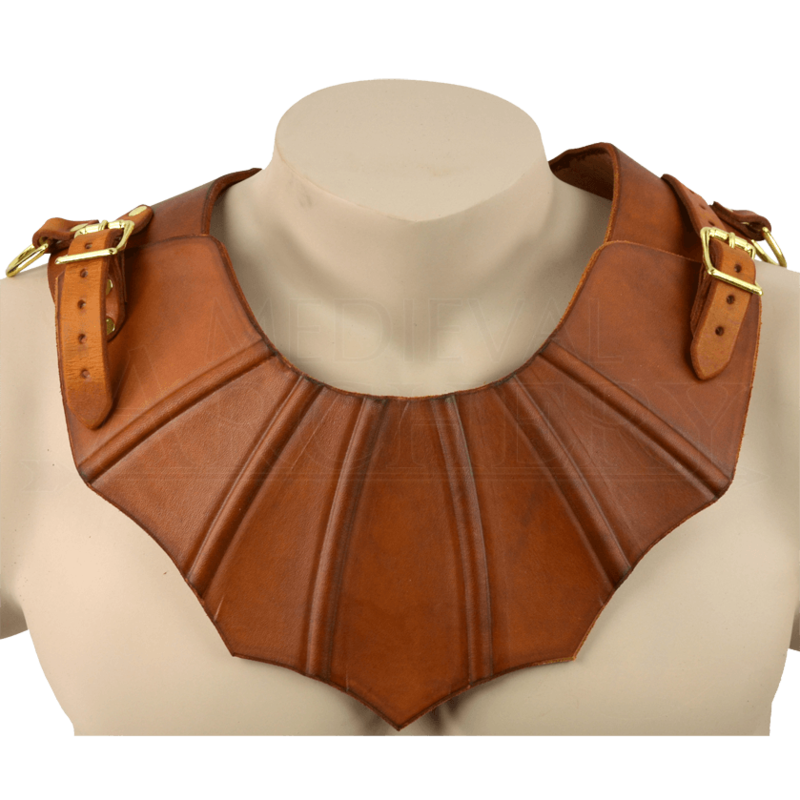 The Gothic Leather Gorget is a great accompaniment to many of our other pieces of leather armor, and is a must-have if you plan on wearing any of our leather pauldrons. The Gothic Leather Gorget comes with a front and back neck plate that are molded to naturally and comfortably fit over the shoulders. There is a d-ring at each shoulder where you can buckle your pauldrons on if needed.